Bekah’s friend Emma came to visit from Massachusetts after Christmas with a gift bag in hand from Kripalu, a yoga retreat centre where her mom works. The gift bag contained lots of goodies including the Kripalu breakfast cookbook. 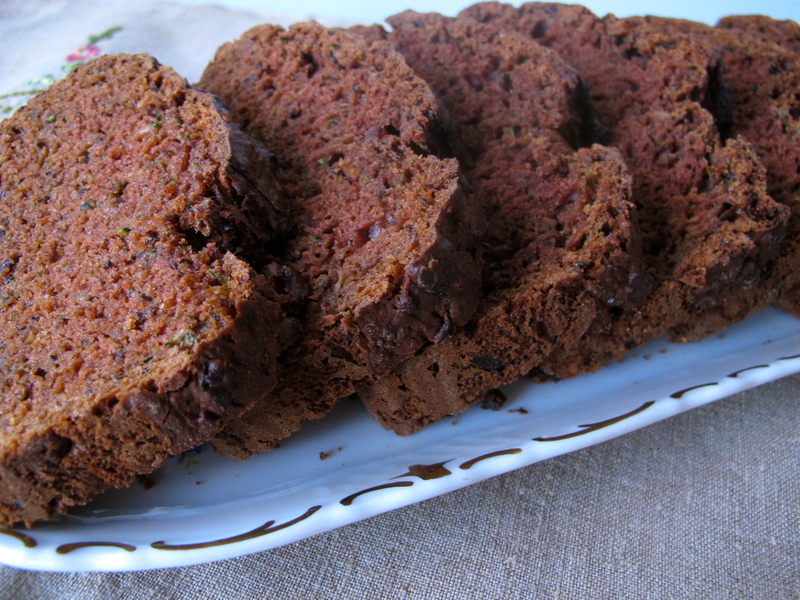 I found this recipe for zucchini bread which makes me happy because my mom used to make zucchini bread all the time when I was younger but I haven’t had a homemade version in ages. I increased the amount of cinnamon and nutmeg because I think it can hold it. The rest is straightforward and easy peasy on a Saturday morning for breakfast. It would also be good for afternoon tea. Preheat the oven to 350 degrees. Grease a 8 x 4″ loaf pan. In a small bowl, combine flaxseed meal and water and let soak for a few minutes. Combine zucchini (if the grated zucchini is very wet, place it in a strainer and press gently with a towel to remove some of the excess moisture) and soaked flaxseed meal in a large bowl. In a separate bowl, combine the oil, applesauce, and vanilla. Add to the zucchini mixture and stir to combine. Add brown sugar and mix until nearly dissolved. Combine the remaining ingredients in a medium bowl. Add to the zucchini mixture and mix well. Pour batter into prepared pan. Bake until the bread is well browned, edges begin to shrink form the sides of the pan, and loaf is firm when pressed, about 1 1/2 hours. This is a moist loaf. When you insert a toothpick in the centre and pull it out, it should come out not quite clean an dhave moist crumbs stuck to it. Let cool in pan. To remove from pan, turn pan over and tap lightly to release. Slice and serve.